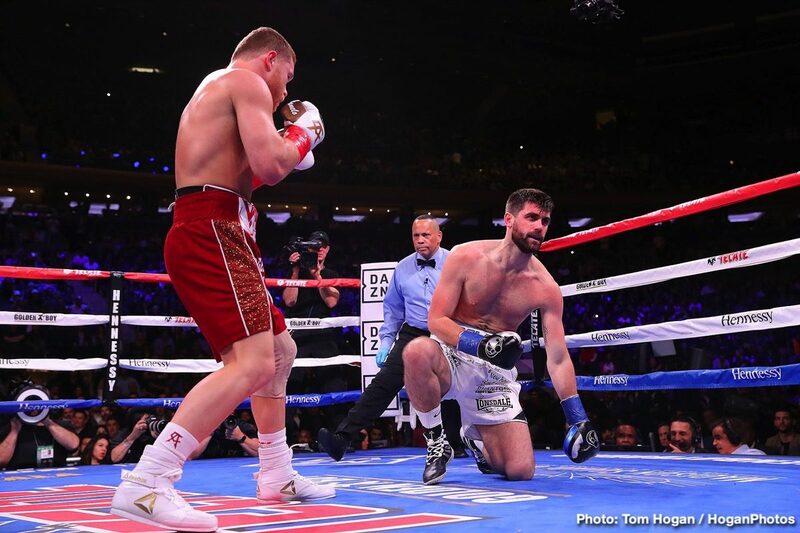 Saul Canelo Alvarez (51-1-2, 35 KOs) put on a brilliant body punching clinic in defeating WBA World super middleweight champion Rocky Fielding (27-2, 15 KOs) by a brutal four-knockdown 3rd round knockout victory at a sound out Madison Square Garden in New York. Canelo smashed the 31-year-old Fielding to the canvas twice in the 3rd round. Although Fielding didn’t look badly hurt, the referee Ricky Gonzalez decided he’d seen enough and stopped the contest. He wasn’t going to wait around to watch Fielding continue to get beaten up, as he had zero defense for Canelo’s body shots. The much taller 6’1″ Fielding was just standing directly in front the 5’8″ Canelo at close range, and letting him tee off. The time of the stoppage was at 2:38 of round 3. In the 1st round, Canelo stalked Fielding and got in close, and dropped him with a left to the body. It wasn’t a total mismatch. Fielding landed a lot of shots in the 1st and 2nd rounds in between his knockdowns. The problem was the punches didn’t have any real effect on Canelo. The stork-like 6’1″ Fielding was standing straight up and down when he was throwing his shots, and that kept him from getting the maximum power on his punches to hurt Canelo the way he’d done with a lot of his opponents during his career . In round 2, Canelo once again dropped Fielding with a hard body shot. Canelo tried to finish Fielding off, but the British fighter was able to make it out of the round by throwing a lot of punches that kept the Mexican star from being able to land the perfect punch. After each knockdown in the fight, Fielding would smile at the referee, looking embarrassed and not hurt at all. Fielding would then look over at his corner to see if they were going to halt the fight. Obviously, Fielding’s corner wasn’t going to pull him out of the fight due to everything that they had on the line. Fielding didn’t seriously look hurt at any time in the fight. He was just badly over-matched by Canelo, and he was fighting the wrong fight by allowing the shorter guy to get close to him rather than keeping him on the outside the way that a better super middleweight would. Fielding seemed to have no conception of the idea that it was important for him to use his height and reach against the 5’8″ Canelo. After the fight, Canelo made it clear that he’s already beaten Gennady Golovkin, and he doesn’t see any point in fighting him again unless the boxing public wants it. Canelo didn’t say who he wants to fight. IBF middleweight champion Daniel Jacobs is a likely option for Canelo. If not him, then David Lemieux could be a possibility. That would be a bad idea on Canelo and Golden Boy’s part due to Lemieux having pulled out of his fight against Tureano Johnson last Friday after being hospitalized for dehyration from trying to make weight. If Canelo is going to fight Lemieux, it needs to take place at super middleweight, not middleweight. Of course, if Canelo is fighting at 168, the boxing public is going to want him to face Callum Smith, who is widley viewed as the best fighter at super middleweight. Canelo should have fought him tonight rather than Fielding. Putting together a fight between Canelo and Callum Smith would be a fairly easy thing for Golden Boy Promotion to do, as the British fighter is signed with Matchroom Boxing promoter Eddie Hearn, who also promoted Fielding. Hearn would be more than happy to put together a fight between Canelo and Smith if he and Golden Boy promotions want that fight. The fighter that Canelo likely won’t want anything to do with is WBC interim middleweight champion Jermall Charlo (27-0, 21 KOs). That’s Canelo’s mandatory, and he might be the best middleweight in the division right now. Canelo had to have been happy at the early stoppage tonight, as his last two fights have been 12 round affairs against Gennady Golovkin, and they were not easy fights for him. That might be one of the reasons why Canelo doesn’t seem eager to fight GGG again.